I’m proud to announce that for the second year in a row, I’ve been selected to the Aircraft Owners and Pilots Association’s (AOPA) Flight Training Excellence Awards Honor Roll, a title given to high scoring flight instructors from AOPA’s 2014 Flight Training Poll. This honor was awarded to 75 instructors in the US. 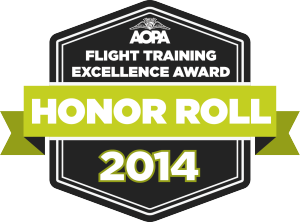 The Flight Training Excellence Awards were created to highlight the best the flight training industry has to offer. “We feel it’s important to recognize flight training providers, like David, who create a quality customer experience and instill a lifelong passion for aviation among their students.” said Brittney Miculka, director of pilot community development for AOPA. To select the award winners, AOPA invited those who have taken flight training within the last 24 months to complete the Flight Training Excellence Poll. 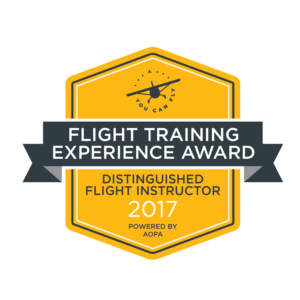 Each individual could nominate up to one flight school and one flight instructor. The online poll was conducted from June 3 to August 23, using a process that contains several safeguards designed to ensure fair competition. AOPA’s poll had more than 3,600 respondents. Just a quick reminder that with the change off daylight savings time, we’re now 8 hours behind Zulu time (aka UTC, GMT). Thanks to Steve from Mac Help for Mom, the site is now up and flying.